The only pictures I took this entire weekend were these few from when we were at Costco. 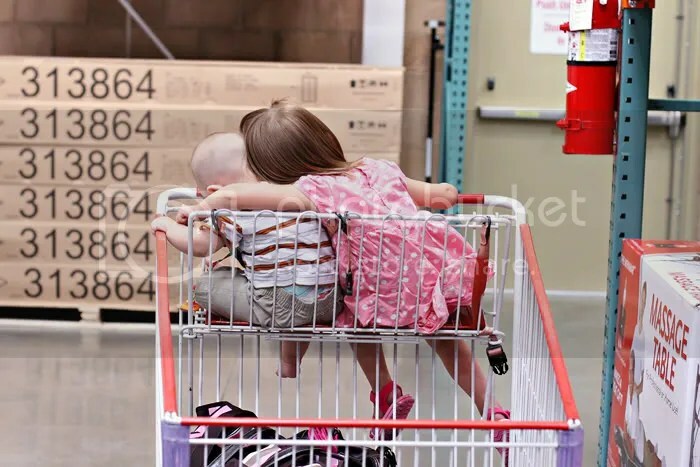 I know you all are probably getting sick of pictures of my kids at stores, but look how cute Sierra and Payson were being when sitting together in the cart.. The whole thing with that lady stealing my pictures was just…so WEIRD. She had a bunch of my pictures from my recent posts and had labeled them pretty much how I labeled them on my blog but she’d changed all our names. WEIRD, huh?! I’m debating putting a watermark on my photos. It’d be something that had my blog address- that way if someone stole my pictures people would see where they stole the image from. What do you think? Should I watermark my pictures? I would if I were you…I know it's more work but that would totally creep me out! Sierra and Payson playing footsie ADORABLE!! Watermark the photos. Just for peace of mind more than anything. Totally weird that she would steal them. I NEVER tire of seeing pics of your kids, whether they're at the store or anywhere else! Soo so cute! I'd never thought about watermarking (in fact, I never even realized the reason that Jordan does it), but now that you mention it, I think it's a great idea. And something I might do as well. 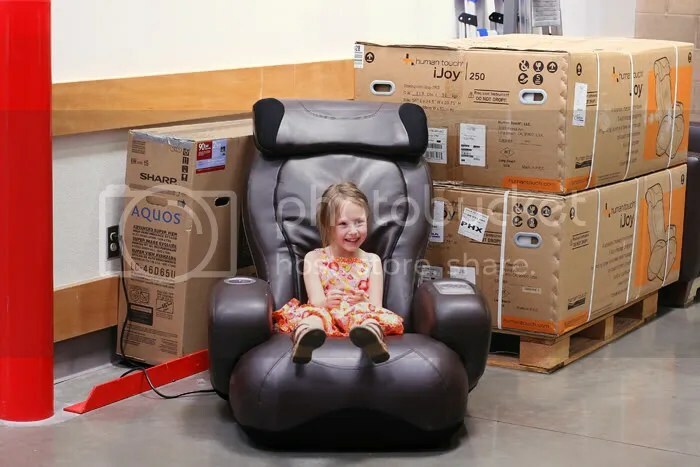 I watermark all of my pictures that have the kids in them. It's not because I think I take great pictures (which I sometimes feel silly because I think that's what other people think), it's just so that they aren't as appealing to steal and post elsewhere. Watermark them!!! How can people feel ok with stealing other peoples photos??? Wow, some people have a lot of nerve. I vote yes on adding a watermark to your photos. I tried figuring out how to do it, with little luck. PSE will do it, but I can't find a good watermark. PS love the picture of Payson and Sierra in the cart sitting next to each other. I would watermark them with something for sure. I watermark all my pictures just because I'm semi-paranoid about things just like that. I still can't get over that someone would actually do something like and I can't tell how happy I am that you found out. That is just a completely weird situation. What a psycho! I would never get tired of seeing your kids…the sibling love is just too cute. Was she passing the pictures off as her own? So weird! Yes, totally watermark them. And yesterday I mentioned that you can lock your photos so they can't be right-clicked and copied…I remember a friend of mine locked hers because someone was stealing her pics. I just don't remember how she did it. Sorry! I'm sure it would be easy to figure out though. The pic in the cart with her arm around him is just priceless. Seriously, priceless! I'm with pretty much everyone else out there. First off: Your kids are adorable. And second: By all means, watermark. Family photo stealing is just plain odd, and pretty much super creepy. I rarely comment, but I enjoy reading blogs. However, I wanted to say that I completely agree with everyone and I think you should add a watermark to each of your pics. It is definitely more work, but if it prevents one person from stealing your photos and posting them, it was worth it! Enough rambling…. Sorry about that! 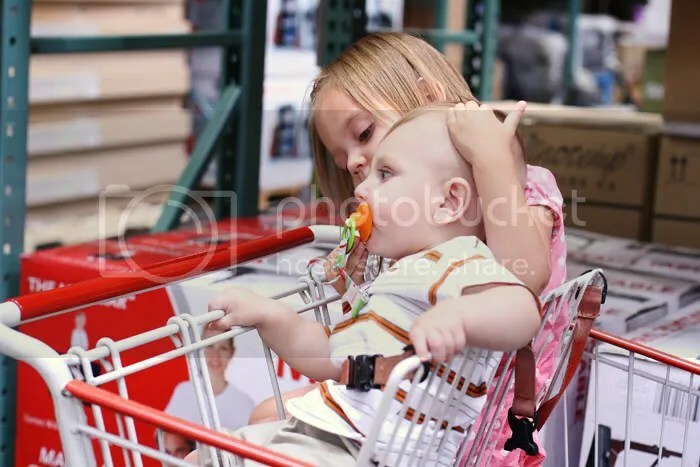 You really captured a couple of sweet moments of your son and daughter in the shopping cart – so precious. Regarding the watermark – absolutely yes! More work but worth it in protecting your photos from the weirdos & thieves out there. Your kids are totally adorable, but I don't see a real need to watermark pictures, unless you're really trying to force promotion of your blog (and you've got lots of instructional images and the like). My thinking is this: Only really odd/nefarious people take other people's family photos and try to pass them off as their own… in which case, your watermark wouldn't gain you much. No it's totally weird and creepy… and I would watermark them… even something simple as your blog address. I recently started doing this.. it's an extra step but it makes me feel better. And I love he pictures of your kids… so cute. hi, a random reader…but i say yes, it's a pain but it's worth it to protect your kids..and the website address is a great idea. I am so weirded out by that woman stealing your photos. I say watermark. I've started to with some. Hopping on to let you know my opinion. I watermark every single picture I post…not because I think all my photos are amazing, but because they are MINE. Period. I'm not promoting my blog or my website, I'm just protecting what is mine. ESPECIALLY photos of my kids. Now, I know that if someone is psychotic and desperate enough, they can save the picture and either crop the watermark out or try to clone it out. And I'm sure there are many people in the world who actually DO that. But there's only so much you can do, right? It takes me about an extra 6 seconds to stamp my watermark on my photos before I save them. Does it add up? Yes. But it gives me a bit more peace of mind.